Oil Reporter isn't a public shaming campaign for BP—no, that'll take care of itself just fine, thanks. This iPhone app, which lets Gulf Coast residents record every oily bird and patch of ruined swampland, is about fixing things. 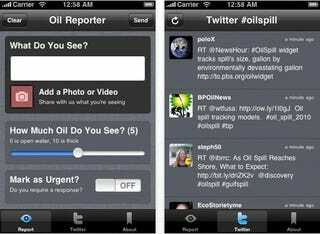 Oil Reporter isn't that different from any other crowdsourced reporting app, technically speaking. I mean, in terms of raw functionality, it's not that different from, say, the app AT&T has its customers use to report dropped calls: Each report contains relevant information about the location, time and circumstances of the incident, which presumably help the recipient fix the problem.